QUESTION: Mr. Armstrong; My family have been lifelong democrats and operated a small local business. We were never in the multi-million dollar class, but always found ourselves considered to the the unholy rich. I remember Joe Biden saying that 90% of small business made under $100,000. Those are most likely individuals and not small business who actually hire people. Obamacare devastated our net bottom line and I have seen the light. You wrote before that small business was the backbone of the economy. Why have the democrats always been against small business? 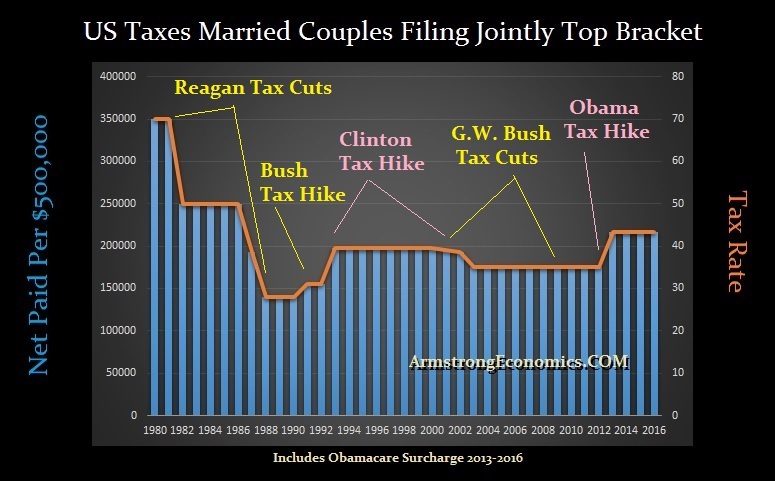 ANSWER: The problem stems from the fact that to collect money, the top bracket for income tax has progressively been lowered. Back at the time of World War I, the definition of the rich was someone who earned $2 million. Considering a car was $300, that was a lot of money. Then for World War II, the definition was raised to $5 million. There were songs like We’re in the money, we’re in the money; from the Gold Diggers of 1933, reflecting the boom times. The government even printed $10,000 bills. 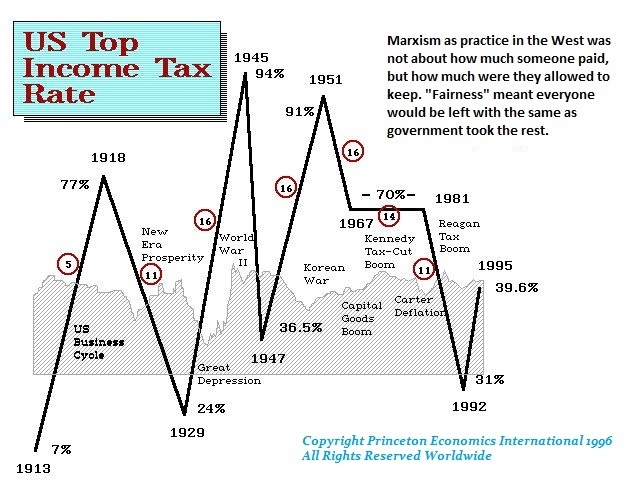 The rhetoric has been Marxist since the Great Depression, but they call it “progressive” or “liberal”. 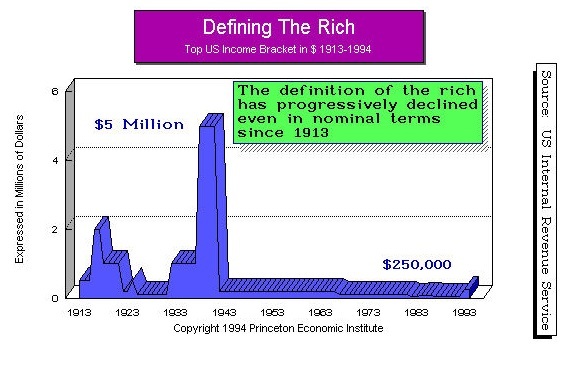 The definition has changed dramatically so $250,000 is now the equivalent of being super rich during the Great Depression earning $5 million. Today, small businesses make up: 99.7% of U.S. employer firms, 64% of net new private-sector jobs, 49.2% of private-sector employment, 42.9% of private-sector payroll, 46% of private-sector output, 43% of high-tech employment, and 98% of firms exporting goods. Joe Biden’s justification that the Democrats do not tax small business is just not true. What he counts as small business is self-employed which can be anything from a handyman to jockey racing horses freelance. That is substantially different from small business that actually employs people. U.S. Census information from 2008 identified a total of 27,281,452 businesses in the United States. The number of businesses operated by proprietors with no employees numbered 21,351,320, which were the self-employed individuals. The Small Business Administration defines small business as fewer than 500 employees – which to me is not small. Add to this the number of businesses having fewer than 500 employees and the number of small businesses comes to 27,262,983. Now, let’s subtract this number from the total number of businesses identified by the census. This produces the number of businesses with more than 500 employees amounts to 18,586. Small business amounts to 99.7% of businesses in the United States. Big corporations only employ about 38% of the private sector workforce while small businesses employs 53% of the workforce. In fact, over 99% of employing organizations are small businesses and more than 95% of these businesses have fewer than 10 employees. As I stated above, small businesses accounted for 64% of net new jobs created. In fact, many of these new jobs are also new companies. The startup rate in 2010 was the highest it has been in 15 years, but that is because 60% of graduate from college cannot find employment in the field that they paid for a degree. Many are FORCED to start their own business typically one-man bands. The rise in startups is because there has been shrinking roles available in big business as many are replaced by technology. Small business ALWAYS grow faster creating more jobs than big business with 500 employees or more. In fact, historically, small businesses grow faster at a rate of 3.4% compared to big business which grows on average only 1.3%. Over the years, I have noted why big business slowly die. The boards become dominated by lawyers and accountants and lose touch with entrepreneurship as well as creativity – i.e. Steve Jobs. The government always focuses on big business because they have the lobbyists who fund campaigns. During the 2007-2009 Crisis, neither the Troubled Asset Relief Program (TARP) funds nor industry bailouts specifically helped small businesses. In fact, slightly more than 20% of the small businesses get loans from banks and do so only with collateral. Therefore, big bailouts and TARP never “stimulate” the economy. Democrats always hate tax cuts and call it trickle down economics. But when it comes to bailouts, they only focus on the rich because they donate to their campaigns. Democrats talk out of both sides of their mouth. If you want to “stimulate” the economy, directly address small business – NOT the big companies who will not hire anyhow. Then there is a huge divide between big business and small business. Big corporations are able to claim health insurance policies for employees as a business expense. Employees pay for those policies with pre-tax dollars. A self-employed business owner could not deduct his health insurance. There was a one-year self-employed health insurance tax deduction in the Small Business Jobs Act, but the Democrats would not allow that to be extended.Small businesses who work from home are entitled to take a home office deduction, but some 60% never deduct it for it often results in an audit and the deduction is notoriously difficult to calculate and thus a grey area the IRS loves to attack. The bottom line is that Democrats rant and rave about the rich, but when it comes to helping small business, they screw them all they can and help big business because they donate for their campaigns. That’s the simple truth.